Kgomo has a longstanding working relationship with Limpopo Judge President MampuruMakgoba, having served his articles as a candidate attorney at the latter’s law firm. He was up against his former mentor when the Judicial Service Commission (JSC) interviewed for the position of judge president of the newly established Limpopo division in April last year. 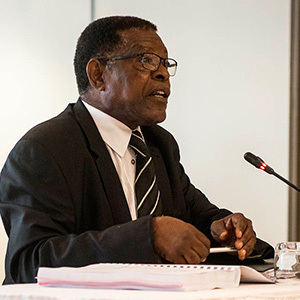 Then, Kgomo appeared insensitive to the gendered language he used and also told the JSC that it would not serve transformation imperatives to appoint women to the Bench if they were not ready. In that unsuccessful interview, Kgomo suggested he would be very much hands-on in any administrative role, telling the commission that he would carry out daily checks on outstanding judgments and keep an eye on the finances of the division. During his interview, Kgomo was hauled over the coals for a series of perceived misdemeanours that emerged during the interview — from his “sexist remarks” that female lawyers were attracted to private practise and expensive cars which obviated their availability for the Bench — where there was potential to earn less money — to the perception that he had pressured junior staff members at the Limpopo High Court to nominate him. Commissioner McCaps Motimele said he was “worried about the manner in which you fraternise with staff, junior staff, who have come together and nominated you and you accepted”. Kgomo declared — perhaps unconvincingly — that “it was brought to me”. When pressed by Economic Freedom Fighters MP Julius Malema on his “sexist” comments regarding female lawyers and his perception that they suffered a dose of materialism, Kgomo retreated, attempted to correct, and eventually retracted. He had initially made these comments in response to questions about the difficulties the judiciary experienced in transforming towards being more representative.